Jewish Home Chairman says defeating Hamas within reach 'for the first time in years,' Israel's decisions to impact world policy on Islamism. Economics Minister and Jewish Home Chairman Naftali Bennett noted the success, so far, of Operation Protective Edge on Sunday, in a Facebook post entitled "Historic Crossroads: Now is the Time to Decide." 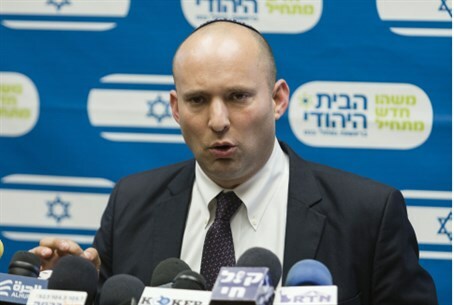 "The State of Israel is at a historic, deciding moment," Bennett began. "It could decide to end Hamas, dismantle tunnels and disarm missiles - to bring Gaza to a state similar to Judea and Samaria, which is without missiles, launchers, rockets, and tunnels. To put the IDF in control and prevent terror from escalating. It can finish with the conflict between the South and Gaza once and for all." "We can prove to our enemies, our neighbors, to the world and to ourselves, that we can could overcome Islamic terrorism," he continued. "For the first time in years, it's within reach." Bennett presented an analysis of the situation, saying that "after three weeks of heavy fighting, this is the situation:"
- Hamas has been severely beaten, but not eliminated. - IDF soldiers have "removed the rust" and are highly competent. - The world understands that we have no choice but to fight for our homeland. - The Jewish people has united like it hasn't in years. - The Front is solid; the Iron Dome, this time, works almost perfectly." Bennett then urged Israel not to succumb to international pressure for a cease-fire. "Hamas is desperate for re-armament, refreshing its forces and realignment so it can harm our troops," he said. "This is similar to a boxing match, when the other side falls to the floor." "To cease fire now is to reach out to the enemy, pick him up, give him a drink, and refresh him," he continued. "Now, now, we must not remove our foot from the gas pedal; we must finish this." "Israel's targets: demilitarizing Hamas of its rockets and terror tunnels in a controlled, effective manner," he added. "The goal: to make Gaza like Judea and Samaria." He also proposed economic incentives to ease the demilitarization process - what he called a "Gazan Marshall Plan" - "because we have no interest in harming the people of Gaza." "No ceasefires, no surrenders, no discussions," he concluded. "You have our phone number; when you're ready for demilitarization, call us. Otherwise, we are moving forward." "[Hezbollah leader Hassan] Nasrallah is looking, Iran is looking, ISIS is looking, the Arab world is looking, the Europeans and Americans are looking - everyone is waiting to see whether Israel will work up the courage to defeat Hamas once and for all." "I believe our Security Cabinet, led by Prime Minister Binyamin Netanyahu, will make the right decision. Now is the time."